A comprehensive and intelligent library that impressively meets all electric guitar needs. Phenomenal sound. Huge level of playability. Background scripting yields unprecedented realism. Takes time to get to grips with. Electri6ity's built-in effects are no mere cheap add-on. 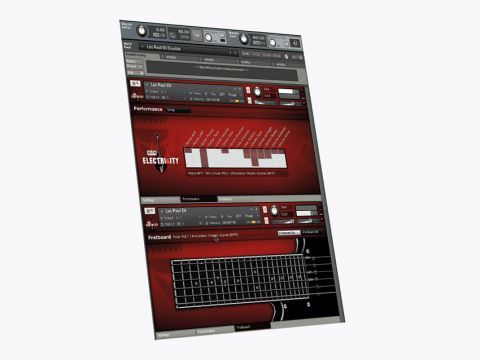 Vir2 is developing a reputation for its quality virtual instruments and the latest of these is the ambitious virtual guitar library Electri6ity, which has been three years in development. Containing over 24,000 24-bit samples taken from eight of the best known electric guitars, this library uses Kontakt 4 as its playback engine and, beyond the raw sample data, it utilises a wealth of scripting information to attempt to provide a complete solution for studio based non-guitarists or indeed for guitarists who don't happen to have several thousand pounds worth of high quality axes lying around. "Pretty much any parameter you can think of can be manipulated via control changes or key switching"
So far, so good, but does this impressive theory equate to a similar level of playability? Well, before we get to that, let's get the essentials out of the way. Electri6ity ships on four DVDs containing an installer for the library and, if you need it, a separate one containing the latest version of the Kontakt Player. Note that if you are a Kontakt 4 user who hasn't updated since your first install, you'll need to run NI's Service Centre to update as this is a system requirement for Electri6ity. The library will munch 27GB of your hard drive space and installing to an internal or external 7200 or 10000rpm FireWire drive is recommended over a USB equivalent. Thereafter, launch Kontakt and activate the library as usual through the Service Centre and you're away. The instruments sampled read as a who's who of the world's most celebrated guitars, namely: Stratocaster, Telecaster, Les Paul, P90, Rickenbacker, Danelectro Lipstick, ES335 and L4 and each has been recorded with Front, Rear and Front/Rear blended pickup positions, from which you're free to choose. Playing modes vary between polyphonic, monophonic and both sustained and muted legato, with slides and other techniques available in all modes for lots of real-time performance enhancement. The realism goes on, as you can choose the release mode in performance, with finger noise, hand mutes and pick noise just three of 14 separate release 'types'. By now you might well be wondering how all of this is selected and intuitively 'playable' and that's where the magic of the Kontakt engine takes over. Vir2 have extensively programmed AMT (Articulation Morphing Technology) and VMT (Velocity Morphing Technology) scripts into Electri6ity's GUI so that, as you play, the engine carefully analyses your performance and uses your playing style and velocity response, for example, to instantaneously switch between samples and playback styles. However, if you want to get involved, rather than let the engine do all of the work for you, pretty much any parameter you can think of can be manipulated via control changes or key switching, so you can hone the guitar of your choice to your own setup and playing style. Within Kontakt, full versions of the instruments are available in both 'DI' and 'Amped' forms, with 'full', 'sustain only' and 'muted' versions. The latter two are offered to dramatically decrease load times which will prove useful. Once you've loaded an instrument, three tabs (or four for Amped models) let you get down to the nitty gritty of setting up your chosen guitar. The most comprehensive of these is the Settings page, which contains a multitude of parameters in various categories, so that you can choose how the strings are tuned or will resonate, how wide vibrato will be for notes that exceed the automatic vibrato threshold or how quickly you want slides to perform to name but four parameters. At both extremes of the keyboard range, a huge number of articulation possibilities are provided to help you effortlessly switch from sustains to mutes to bends to strums to slides to picks and so on. Choose an 'Amped' guitar and you'll find the instrument loads with its own 'Effects' tab within which you'll find three custom effects generators. The first is a multi-effects unit with phaser, flanger, chorus, reverb and delay algorithms, one of which can be selected to provide a series of parameter dials. The second is a 'Screamer' pedal style distortion unit with tone controls, overdrive and amount dials while the final section provides amp modelling. There are seven 'modelling' types available including Modern, Metal, British and Classic, with three microphone positions available. You can choose between Dry, Medium and Wet room treatments and independently bypass one or either of the Drive and Amp stages of the amp model you build. The results are excellent and by no means a 'cheap add on' to the DI alternatives. We could see ourselves using this integrated solution rather than simply firing up Guitar Rig, Amplitube or Amp Designer as a default option. Electri6ity is a phenomenal library and certainly represents the most comprehensively sampled and organised virtual guitar system we've seen to date. You'll need to commit to Electri6ity, as its almost overwhelming range of performance options take some learning. The important thing, though, is that if you want a range of well-sampled guitars, powered by an engine that will let you use them to create 'photo real' performances, Electri6ity will step up and deliver, regardless of the musical style you prefer to play. A truly stunning library.